The Japanese director Mizoguchi Kenji died, far too young, aged 58 in 1956. His last production was a ‘modern’ film, both in setting and style and therefore something of a surprise from a director who had become well-known in the West for a strong ‘personal style’ of cinematography, staging and editing developed mainly in period films. 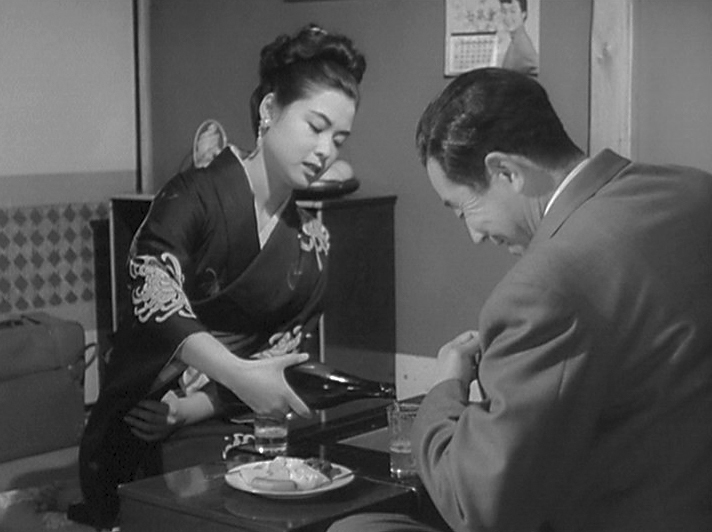 Street of Shame is that familiar genre of melodrama associated with the decline of Tokyo’s ‘pleasure districts’ in the 1950s – see Naruse’s Flowing and Mizoguchi’s own Uwasa no onna for comparison. But whereas those two films dealt with geisha houses in which young women were still trained to serve men as hostesses for an evening’s entertainment – supposedly including singing and playing the shamisen – Street of Shame is set in an open brothel (named ‘Dreamland’!) from which the women dash out into the street to drag customers in. Mizoguchi worked on this Daiei film without his usual scriptwriter and though the focus on ‘suffering women’ is familiar, the pacing and the multi-strand narrative seems a departure. We meet the brothel owner and his wife (the ‘madam’) and a varied selection of ‘working girls’. Yumeko is an older woman with a grown-up son she has left behind in her village. Yorie wants to marry and settle down in rural Japan. Hanae is married to a tubercular man who can’t work and they have a baby. Yasumi is the most attractive and the highest earning of the women, but she has large debts to recover. Finally ‘Mickey’ arrives in a pair of capri pants as a young woman from Kobe who has been jilted by her American boyfriend. She is pleased to be away from her parents. The short narrative (under 90 minutes) follows all five women, each of whom have their reasons for needing to sell themselves in the brothel. But times are changing, Members of the Diet (the Japanese Parliament) are intent on making prostitution illegal. The routine of the house is interrupted at various times by radio announcements about the progress (or lack of) of the campaign. The brothel owner takes a paternal stance, telling the women that what he does is a ‘social service’ in finding them work that pays more than any other employment they could find in Tokyo at the time. The DVD I viewed was a Masters of Cinema disc with both an Introduction and a very detailed commentary on the film by Tony Rayns (unfortunately since I rented it, I didn’t also get the informative booklet). Rayns is of course a diligent scholar and he talks entertainingly about Mizoguchi, Daiei, the cultural and political context of the legislation on prostitution and also on the aesthetic deployed by Mizoguchi. The only aspect of this that I found surprising was his observation that most of the film was shot on a Tokyo studio lot – after Mizoguchi was refused co-operation on a location shoot by the brothel owners in Yoshiwara, the pleasure district. It is true that indoor scenes are all studio bound and also some street scenes, yet there are also several scenes set away from the pleasure district, seemingly on location. For this reason, it felt different from some of Mizoguchi’s other films. I was struck by the way that Mizoguchi used locations in a more energetic way (i.e. for dramatic, even ‘action’ scenes) than Ozu. But of course, the studio scenes are beautifully designed and staged. I’m sure that many will agree with Rayns when he argues that Mizoguchi’s staging of scenes in depth with foreground and middle-ground action and unconnected activity in the background is never ‘show-off’ stuff like Welles in Citizen Kane, but just the solid professionalism of a master. Most of all, however, I enjoyed this film very much for the energy of the playing by the whole cast, including some wonderful melodrama moments and for the skilled editing which maintained the pacing across five stories so brilliantly. It’s a humanist story – the women have problems and they attempt to solve them. Sometimes their behaviour towards clients is deceitful, at other times they show compassion. Everyone is good and bad in this sense. The film doesn’t take any kind of moral stance. Mizoguchi himself had used brothels as a younger man and he understood the world of the film. Prostitution was finally made illegal soon after the film was released. I can’t wait to get really stuck in to 1950s Japanese Cinema again, so I think some more short reviews will follow. This entry was posted in Japanese Cinema, Melodrama, Womens Film and tagged Mizoguchi Kenji. Bookmark the permalink. Really great film and article. i like your approach.